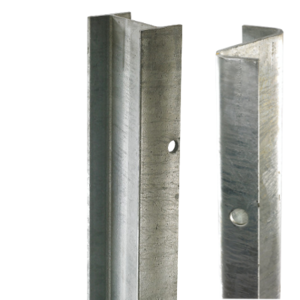 Posts are available from our large stocks in RSJ and light & heavy duty Z-section profile, to bolt down or to cast into concrete. We are also pleased to offer a range of spring buffer posts to suit most situations. What type of post should I use? The type of post and the centres they are set at, should be selected to suit the level of protection required and the frequency / severity of impact that you might expect in a given situation. Whether you choose 3.2M , 1.6M or 800mm centres for Armco Barriers or 2.4m, 1.6m, 1.2m or 800mm centres for OBB obviously affects the rigidity of the system and the amount of deflection of the beam under impact, likewise the post section has a similar effect. If you or your insurer requires the finished barrier to be BS6180 or BS6399 Pt1 compliant, then your choice should be RSJ or spring posts set at 1600mm centres. An Armco or OBB barrier with this post configuration is tested and proven to co comply with the requirements of the standards to contain a 1500kg car, traveling at 10mph and impacting at 90° to the barrier, which is installed at a height of 445mm to the centre line (the recommended height for car parks). In the case of the RSJ posts this is achieved with minimum residual deflection, ie the posts are not left visibly bent, but it is recommended that after a known impact that the section should be replaced.